New Delhi Sep 16 (IANS) Actor Sikandar Kher says that whether it s about scripts or producing films or taking advice in general he likes to approach actor-producer John Abraham. The two will share screen space in the upcoming film "Romeo Akbar Walter (RAW)". "John keeps saying that it is one of the best scripts he has ever worked on and he has done so much of work. Other than being somebody who has been an actor for so many years and has done so well he has even established himself as an A grade producer " Sikandar told IANS. "He is a great producer and has produced some really great films. I keep asking him a a lot of questions. He is really amazing to work with. He is such a big star but when you are on set with him he makes everyone around him comfortable. "I ask him what does he think of scripts producing films what goes into it. Sometimes I ask him what type of films I should do in terms of how to go about them because he has been done it for so many years." It s not like Sikandar son of veteran actors Anupam Kher and Kirron Kher has a list of people that he should approach. "When you look at somebody s body of work and you have respect for them at some level... you will ask them questions. If I want advice or something I will ask John. He is always there to help me out and give me advice " said the actor who also thanked John by sharing a post on social media earlier this week. 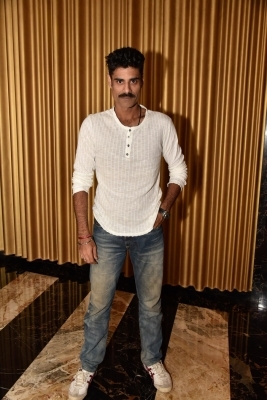 In the film Sikandar acts as John s nemesis.